Ndamukong Suh’s visit to the Raiders has been called off, sources tell Ian Rapoport and Mike Silver of NFL.com (on Twitter). The free agent defensive tackle has returned home and is not likely to make a decision today, Rapoport adds. The Rams made a strong impression on Suh, but he’s also considering the Saints and Titans. The reason for Suh’s visit being cancelled is not immediately clear. Assuming the Raiders stick with a 4-3 scheme, they would presumably like to upgrade from Eddie Vanderdoes as one of their starting interior line spots. Vanderdoes appeared in all 16 games last season and started 13 of those contests, but he suffered a torn ACL in the 2017 season finale and it’s not clear how he is viewed by new defensive coordinator Paul Guenther. Suh would have been a phenomenal addition to the defense, but the Raiders now appear to be out of the running. All three teams would present Suh opportunities to win, but the Rams have the best defense of the bunch. 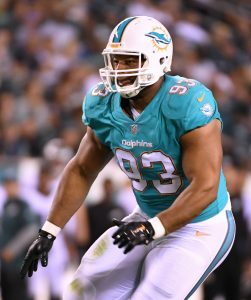 Suh could thrive under Wade Phillips‘ tutelage and put himself in position to cash in again in 2019 if he signs a one-year deal. If he’s smart he’ll sign there. That’s best bet @ contending. Especially now that Seattle is rebuilding. In what way is LA more of a contender than the Saints? Because people from socal think they are better than everyone else, duh! Because they are? I’m a 12 & can even admit this. Do you smoke crack or are you being serious right now? Rams played saints last year and beat them pretty bad too. Had it not been for a couple kamara tds in garbage time the score would of looked alot worse. Drew Brees is another year older, and the type of numbers kamara put up last year are almost impossible to duplicate. Just MO, but Rams will regress due to too many big personalities and me first players in their lockerroom.. I thought they had a good thing going to build on, but instead blew it all up to add overpriced vets.. Good for Madden 19, bad for on field preformance. Strange they don’t mention Seattle. He’s been in constant contact with PC, they have cap space, need, and he’s from the PNW. JS isn’t likely the drop the coin needed to get Suh, plus they covet compensatory picks. That’s just his MO. I don’t think that Suh would count against getting a comp pick because he was cut. You’re right. He wouldn’t count. Suh was cut. I believe he won’t count into the comp pick equation. Because he’s not signing in Seattle and to be honest i don’t really want him. To me he’s more a piece you add to put you over the top. PC & JS have a lot more holes to plug. I personally think after watching last season that Wade and McVay will be able to keep all these guys under control. I think yes they have the most personality of any team but I don’t think it will be as bad as previous years. I think Peters, Talib and Suh were all in bad situations that led to those outbursts. Don’t get me wrong they have personalities but I don’t think it will be as bad. And I don’t think the rams get Suh unless he takes a paycut. Rams are focused on Gurley, Goff, Donald, Peters extensions plus other young guys so maybe if he took a heavily frontloaded contract. He will certainly put the Rams over the top! Suh had 61 yards in penalties in 2017 54th among defensive players. 38 yards in 2016. 61 yards in 2015. 43 in 2014 and 2013. 25 in 2012. 65 in 2011. 87 his rookie year. So perception vs reality.